Welcome! We're glad you're here. The Jeffersonland Chorus is a men's a cappella Barbershop Chorus based in Charlottesville Virginia. We are always looking for new members, new sponsors, and new opportunities to perform. Please browse this site to find out more about us, and don't hesitate to reach out with any questions. We looking forward to meeting you soon. It's great to be a Barbershopper! 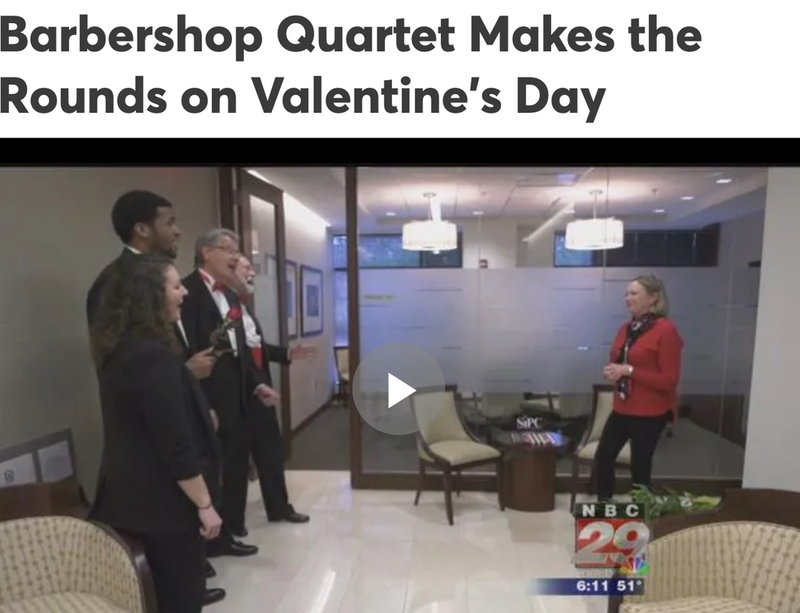 The Chorus fielded three quartets - Lady and the Tramps, The Barbers of Cville and The Delegates and performed over 50 Singing Valentines in the Charlottesville area. Serenades were predominantly in the city, but we ranged from Zions Crossroad to Crozet, performing to individuals, groups and businesses. Tears of joy were shed by many recipients. Thanks to everyone who participated. The Delegates - Nico Scopelliti, Dan Ray, Dude Siebert and Craig Scott during their travels. Barbers of Cville serenading one of our recipients who has already said we’ll see her again next year! Aged to Perfection, Harmony Incorporated’s 2018 International Contest winners, the Jeffersonland Chorus and Skyline Harmony Chorus plus their featured quartets will be singing at The Center December 30th at 2PM. Robby Gough, our past President and go-to problem-solver is awarded his 50 year certificate by Nico Scopelliti. He joins Ken Wallenborn, and John Davis as the foundation on which our group has thrived for half a century. We perform at many functions in the area. On November 3rd, Our director, Alexa Beal’s quartet, Aged to Perfection, was awarded highest honors in the Harmony Inc International Contest. Alexa, Gaye LaCasce, Kathy Pomer and Ellie Pomer were crowned Harmony Queens with a first place International finish. They scored an average of 80.7, which, trust us, is a really high number! We also celebrated another 50 year membership milestone. John Davis has been singing barbershop since the Johnson Administration. 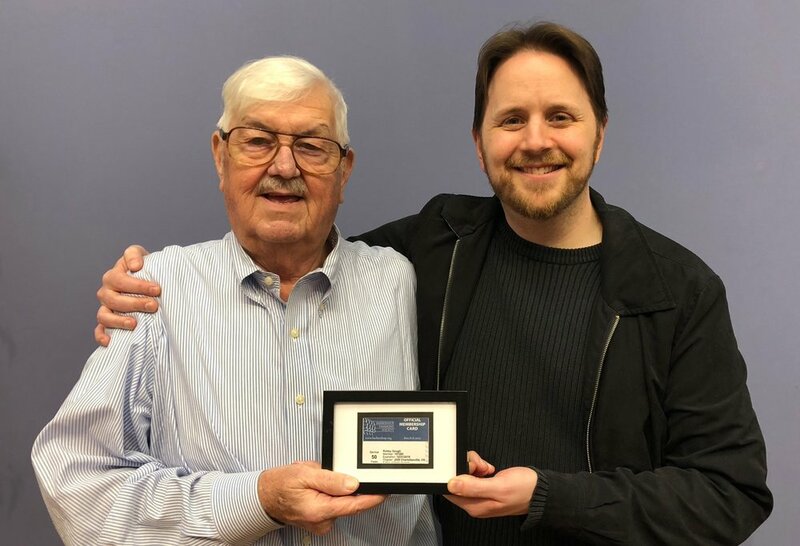 John (on the left below) is being presented with a framed version of his BHS membership card by Tom Guterbock our chapter Secretary. We laud John’s continued contribution to our Chorus and to our art form. TomSox National Anthem - JLC had the honor of singing our national anthem on Friday July 13 as the Charlottesville Tom Sox took on the Staunton Braves. We also were featured in "Baseball movie trivia". We scored 4 out of 5 missing a question about "Field of Dreams." The consolation prize for Dan, George and Tom was a pack of old baseball cards. 50 years! That's what it said on the new BHS membership card of our founder, Ken Wallenborn. We didn't just give it to him; we handed it to him on a silver platter! We welcome Alexa Beal as our new director. See our Members Page for more details about Alexa. The singing lesson program has swelled our ranks. 28 men attended our most recent rehearsal. It is great to have so many voices in the group. Valentine's Day - Our two quartets - Lark and Barbers of Cville sang in dozens of places across Albemarle County. Thanks to all and we look forward to next year! JLC was honored to participate in this year's Grand Illumination festivities. We start around 10 min and 20 sec into the performance. We sung the classics, some new tunes. and even an original jingle written specifically for the UVA CCU! With great fanfare, Lark and the JLC hosted our first annual personalized E-serenade using an original jingle. Recipients called it the best Mom's day gift ever!. We just finished our Singing Valentine program. To those who participated, we hope your enjoyed the experience. We have a busy year planned. We are looking forward to Mother's Day. We're also headed to Harmony College East to sing and to learn. The Chorus is in demand around the holidays. We're providing festive holiday songs in the a Cappella Barbershop style. Look on the Events/Shows page to find out where we'll be. Here we were at the City of Charlottesville Grand Illumination along with other acts like the Virginia Consort and the UVA Virginia Gentlemen. It was a great event with an enthusiastic audience. Thanks to the City and the sponsors for making it possible! NBC 29 Lady and the Tramps is featured in a video segment on the local news. CBS 19 The Delegates quartet is interviewed while delivering a Singing Valentine. The Jeffersonland Chorus is prominently mentioned in The Daily Progress. Sam Morgan, one of our members, is interviewed and discusses the meteoric rise of a cappella singing on college campuses, how we are reaching out to the community and how the Chorus is modernizing and is an opportunity for recent graduates to continue singing. 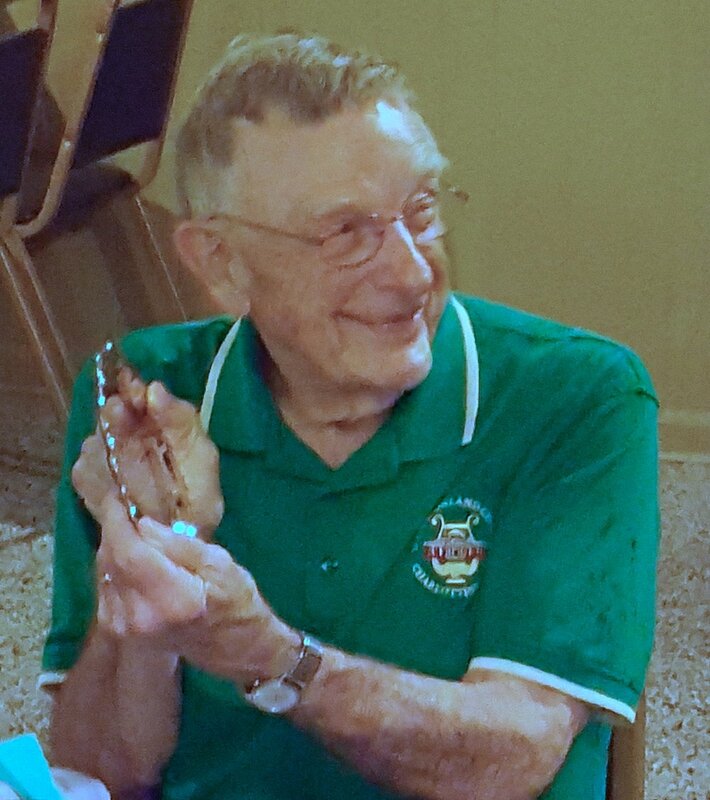 Fred Waring inspired Dr. Ken Wallenborn to form the Jeffersonland Chorus in 1968. Read all about it in this great Daily Progress article.